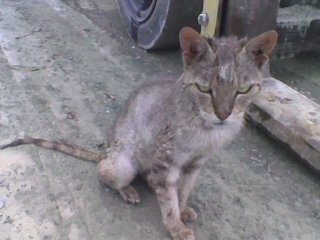 Back in 2009 I found a cat. She was living (if you can call it living) in a timber yard at a company called northside trusses and frames in Brendale. That is not a good company to work for, you have to be very careful what you say and to whom. Most of the people there are related to one another. They profess to look after the people who work there but they wouldn't even provide a meal for the cat. As an employee I approached management about doing something for the cat, but was flatly refused. While I was working there, I would take food in to work every day and give her some twice a day. She very quickly learned which forklift to watch out for, because it meant that she was about to get a feed. She was literally a skeleton with a very dirty, flaky skin over it and what hair she had was very matted and home to a million fleas. These first two photographs were taken at the timber yard with a mobile phone camera. After a week of organizing at home, I took a cardboard box to work with me on the Friday and as I finished for the day I coaxed her out of hiding with a last suggesting of food and quickly bundled her into the box, using a towel to hold her because she was essentially a wild cat with very long claws. When we arrived at home I showed her where the kitty litter was in the corner of the room and also showed her where her food was with a fresh plate of one of her favorites. 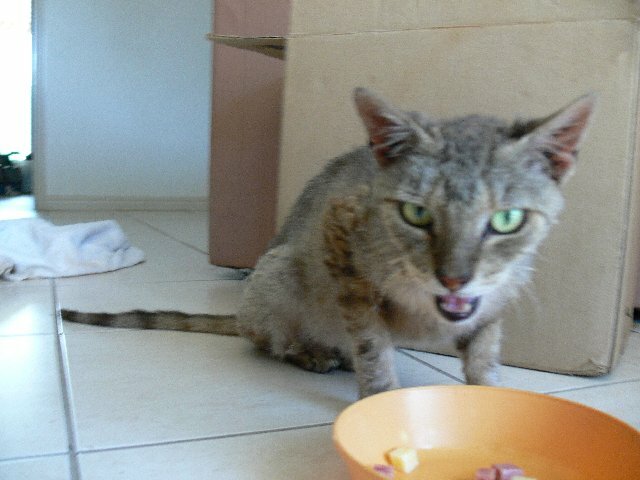 She particularly likes the loaf style of canned food and refuses to eat the casserole style of food. After a week of staying inside and learning where everything was and where the best places were to hide, I introduced her to the cat trap. She was quick to learn how to use it and go outside and very soon the kitty litter was no longer needed. For the first month or so outside she would go to the back of the yard and hide under some long grass. She went to see the vet and was given a clean bill of health, which is remarkable considering how malnourished she was. Her legs are a bit wobbly but everything else seems to be okay. 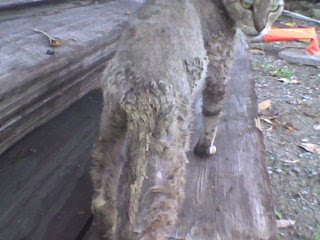 We had to do a lot of combing to get all of the knots and other rubbish out of her fur and give her flea treatment. She has now resumed doing her own grooming. The third photograph is PC sleeping in one of her favorite places in the garden where the morning sun keeps her warm. She now has a dozen feeds a day, or sometimes it seems like that, and she has put on quite a bit of weight. 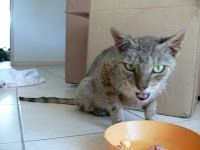 She has become very talkative and friendly and knows when to come and ask for a bit of a rub. It is a very different life now. Dare you to take my food. I can't save all of them, but every now and then you see something and you just have to do what ever it takes to help them out. PC has become a good friend.